Gah. I’ve been such a terrible blogger. My life has been a K-drama watching wasteland, and there’s a strong argument for not blogging at all, if I have nothing to say about k-drama. It is perhaps fitting, then, that my post picture is that of a drama not from Korea, but Japan. Why have I taken this long to watch 2004’s Pride? I can’t really say, but it is shame on my Kimutaku-loving fangirl heart (I fell in love with his voice in Howl’s Moving Castle, can you believe it). Well, partly I had to find decent subs (those on my store-bought DVD are well-nigh incomprehensible), which are well worth the effort. Anyways, now I’m all fired up and running on Pride, I’m one very very happy tv bunny. Read on for witterings about Kimutaku’s perfection, the trainwreck that was The Heirs, thoughts on The Queen’s Classroom, and musings on Shin Don. And eclectic ranting about television generally. So, in case anyone is interested (which, I’m sure, not)… Confession time! 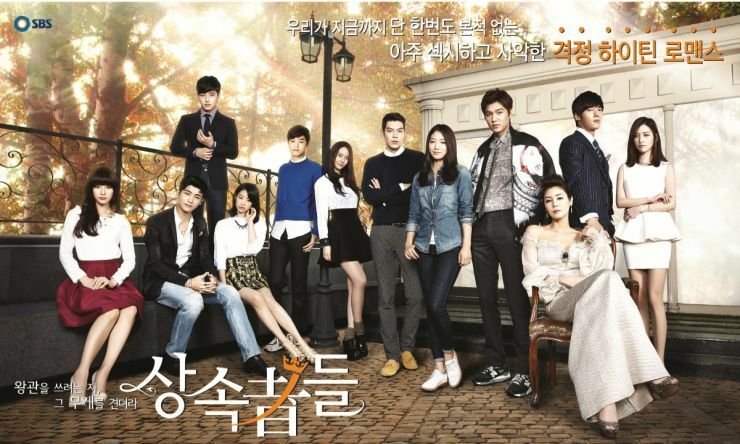 I’m still watching The Heirs (SBS, 2013). I’ve knocked myself out with four full episodes. Why? WHY? I find it exceedingly lame, and I’m not even talking about the Engrish or the Lame Surfer Dude. It’s just hollow, and carelessly put together. I can’t care about anyone or anything in it. See this ridiculously crowded and pose-y publicity poster? It just about sums it all up. Characters are randomly tossed in to fill up space, and they all just pose around. But maybe it’s precisely because it’s a whole lot of nothing that I find it an unoffensive thing to have playing on my computer after a hard day’s work, while I surf the news. If the show ever buckles down to taking itself more seriously and writer Kim Eun Sook’s ideology makes an effort to show itself, that’s when I’ll probably bail. I’m on Episode 14 of Shindon (MBC, 2005). It’s very absorbing, but at the same time it’s not an easy watch. It doesn’t work if I don’t give it my full attention. I’m also starting to see why it doesn’t agree with every viewer. It’s quite different from most popular k-drama offerings of today, which sometimes seem to me more in the nature of pop concerts — slick moves, loud music, tons of eye candy, instant gratification, and sheer good fun. Shindon is more like a classical music concert — no gimmicks and no concessions. If you are not in the mood for it, it could seem tedious, lame, and even silly, and at some point you might fall asleep (as many members of classical music concert audiences in fact do). But if you can attend to it and stick with it, it can be rewarding, enriching and enduring. 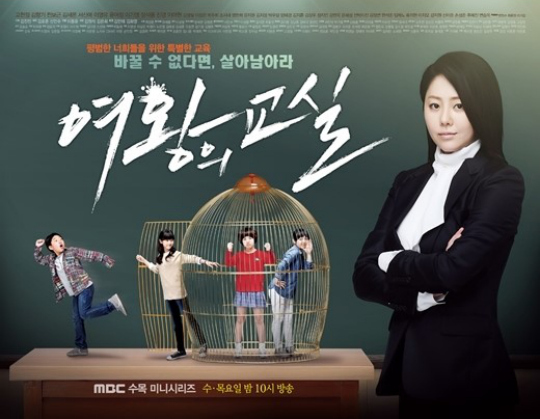 I’m starting The Queen’s Classroom (MBC, 2013). Because I like lead actress Go Hyeon Jeong (All power to Sandglass Alumni!). And because I like stories with kids, provided they are done well, and I hear this one is. Let’s see how it goes! So far I like the breezy, not-overcute vibe.